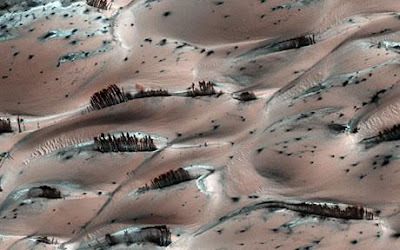 Not really trees, but an optical illusion captured by NASA's HiRISE camera in orbit around the red planet. What appears to be a scattering of pine trees is actually several trails of debris near Mars's north pole, left behind as the ice cap goes on its seasonal retreat. Mash down here for more about the "trees" of Mars!